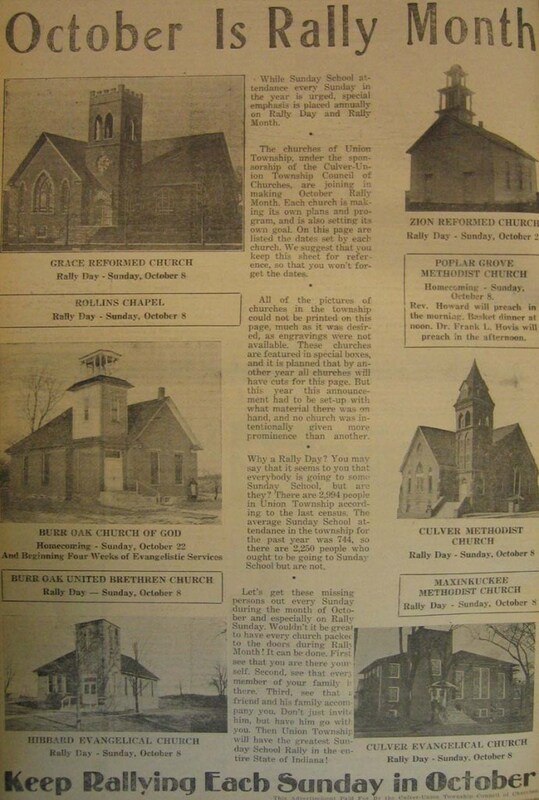 Above: An October, 1939 full-page feature on the Culver community's church "rally," which features photos of many area churches, some not seen elsewhere in photo form. 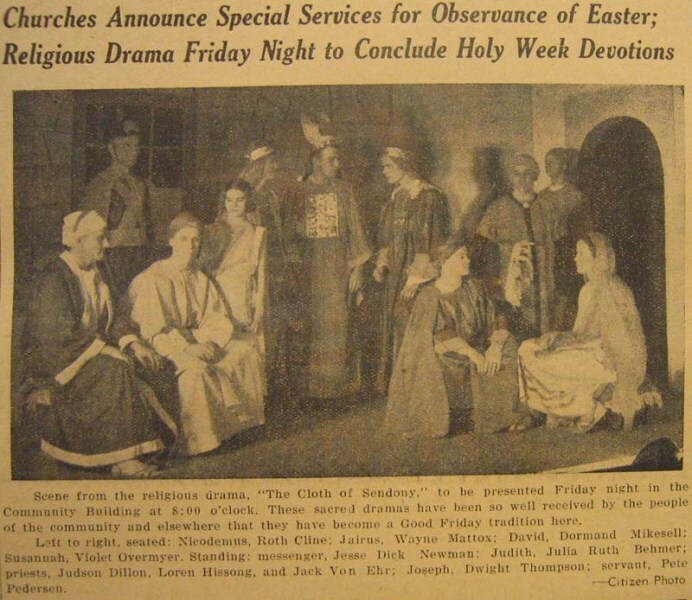 Above, left to right: Culver's churches came together for Easter, 1939 to present an Easter drama in the Community Building (the elementary school gymn); a 1939 Culver Citizen article on faculty training for the "School of Christian Leadership" in Marshall County. 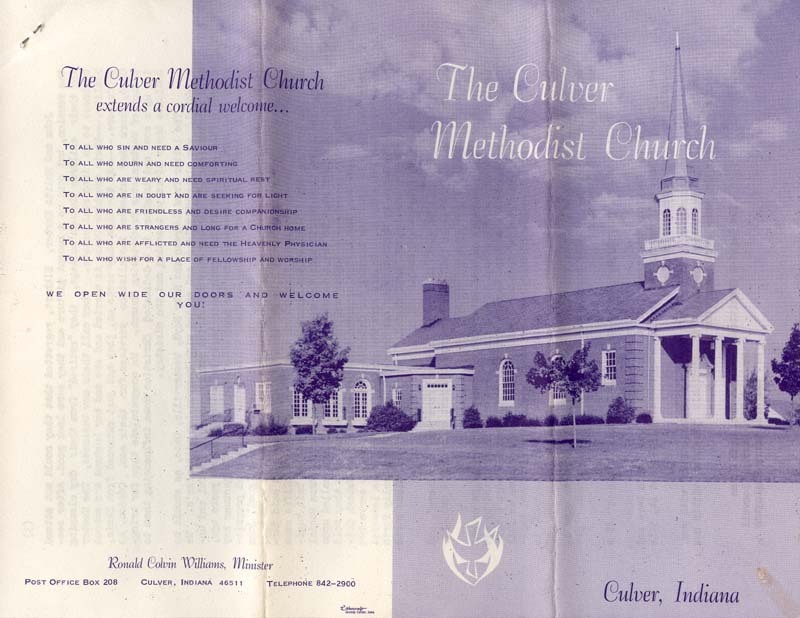 Article: Methodist Congregation Fitting Observe Fiftieth Anniversary...1918 article by Dr. Benjamin Wiseman on the history of Culver's Methodist Church. 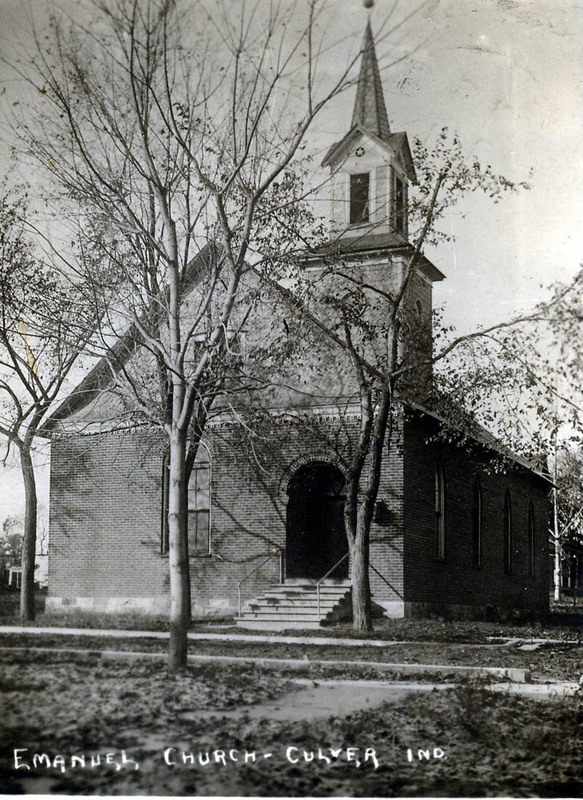 The original church building was erected in 1868 on the corner of Main and Washington Streets, the present site of the new addition to the Culver Public Library. 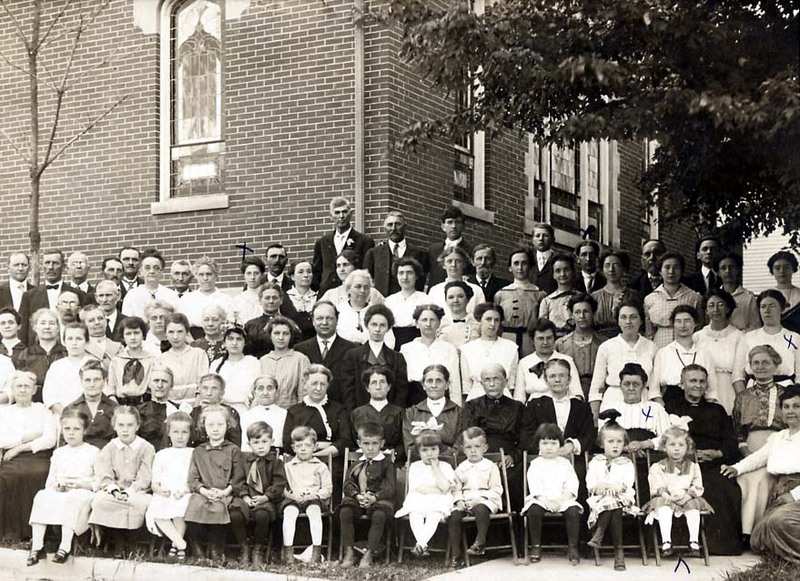 The above article and Mark A. Roeder's writing (here) explain the details; the church was remodeled in 1898 to its appearance in the photos below. 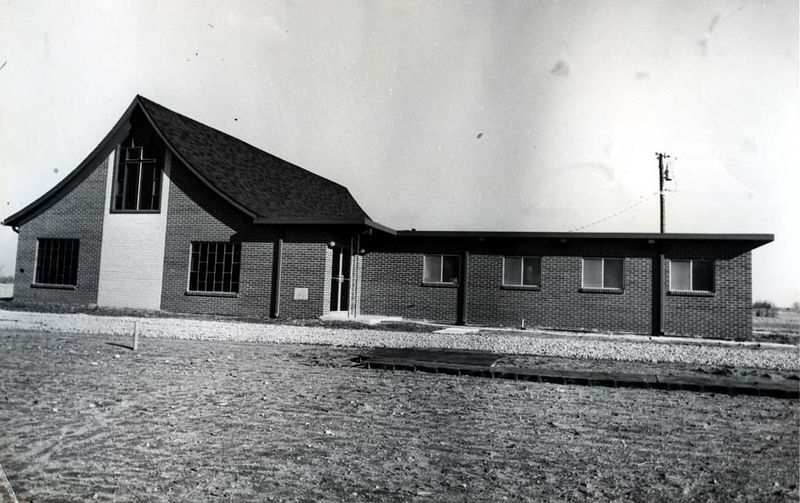 In 1954, construction began on the new Methodist church building on College Ave. and School Street, today's Wesley Methodist Church, and the earlier Methodist Church on Main St. was torn down. 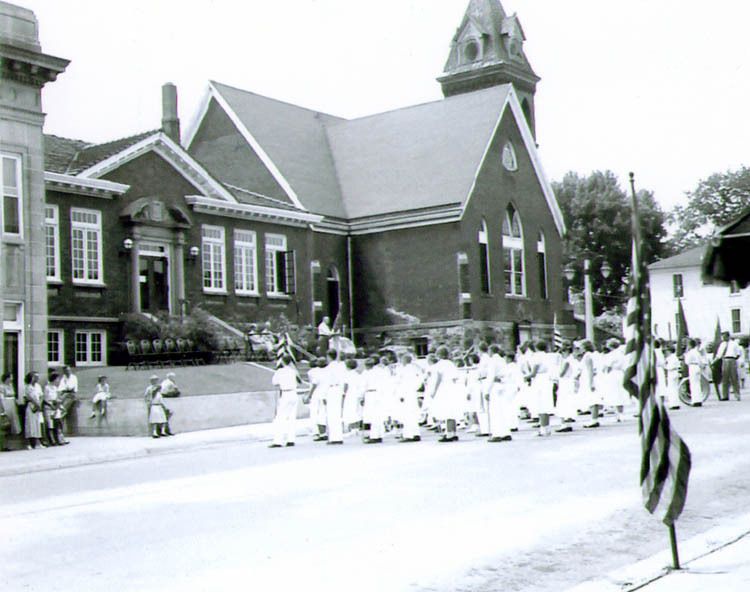 The church can be seen just beyond the Carnegie Library, 1957 (photo donated by Edna Taber). A postcard captioned, "Main Street Looking North," probably near the turn of the century or before, as evidenced by the lack of pavement. The steeple of the church is just visible on the horizon. This postcard depicting Main Street is dated 1912, and faces south. Prominent on the right is the Methodist church. 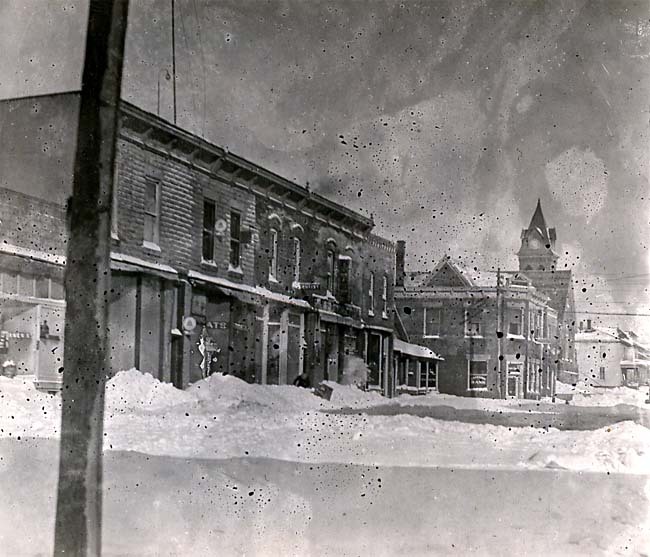 Main St. under the effects of a blizzard, in this undated photo supplied by Marizetta Kenney, probably taken in the 1930s. Visible is a dentist's shop, the drug store, the State Exchange Bank, Carnegie Library, and the Methodist Episcopal Church in the background. Similar view of Main Street as the previous photo, probably from the same snowy day! Postcard depicting Main Street as it appeared in the late 1930s, the church tower visible on the left in the background. 1939 postcard showcasing the United Methodist Church on Main St., seen from the northeast. 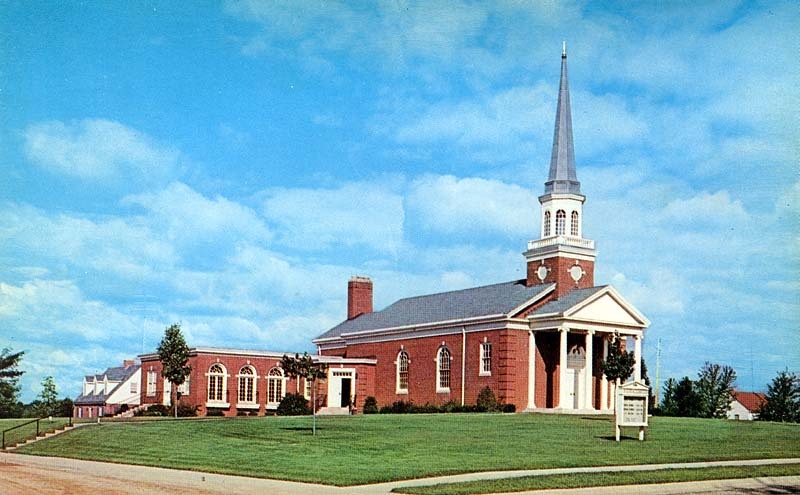 A postcard depicting the Wesley United Methodist Church, the church that replaced the United Methodist Church. 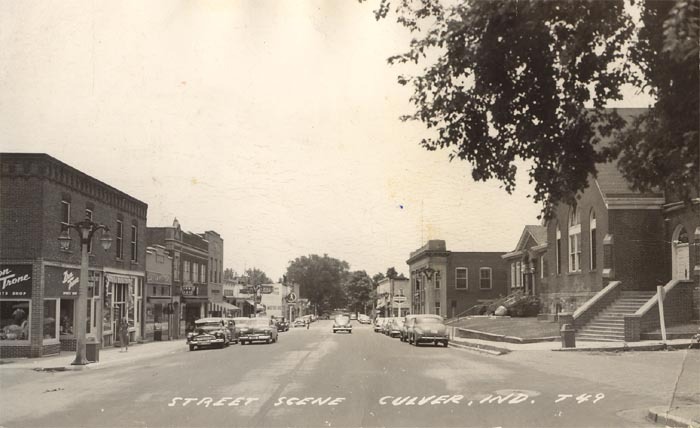 Wesley is on School Street and College Ave., since 1954, though this postcard is undated. 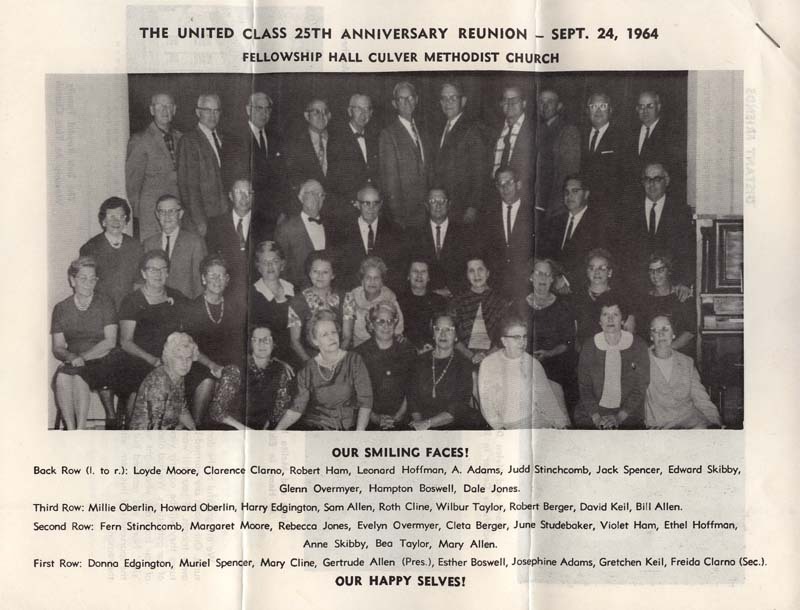 The cover (photo 1) and interior of a brochure celebrating the 25th anniversary of the United Class of Culver's Wesley Methodist Church in September of 1964. 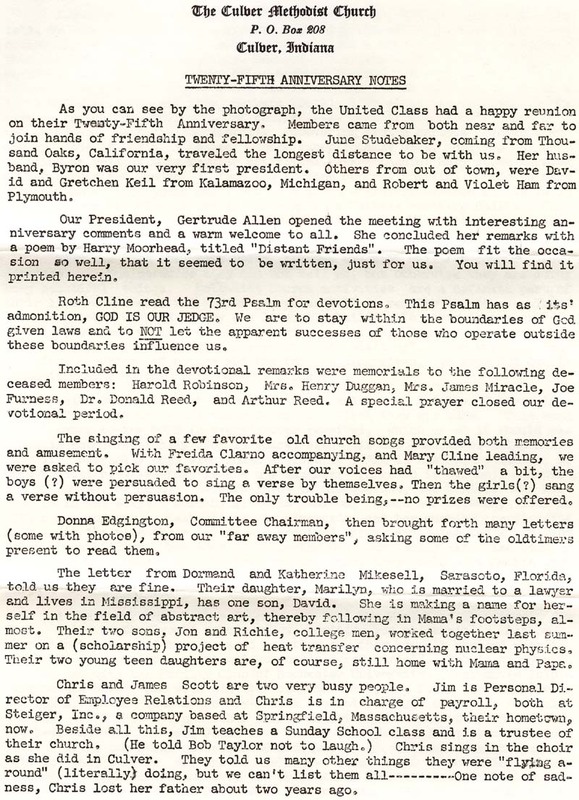 "25th Anniversary Notes" on three pages that accompany the 25th anniversary of the United Class of Culver's Wesley Methodist Church in September of 1964. Notes are credited to Mrs. Roth Kline, Mrs. Hampton Boswell, and Mrs. Harry Edgington. 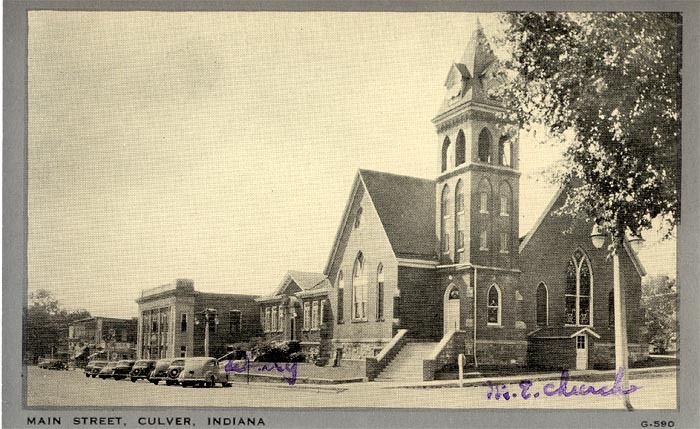 Postcard of the Emmanuel Methodist Church on S. Main Street in Culver, which is its current location (although apparently in a different building). This building was apparently built in 1924, though the postcard is undated. 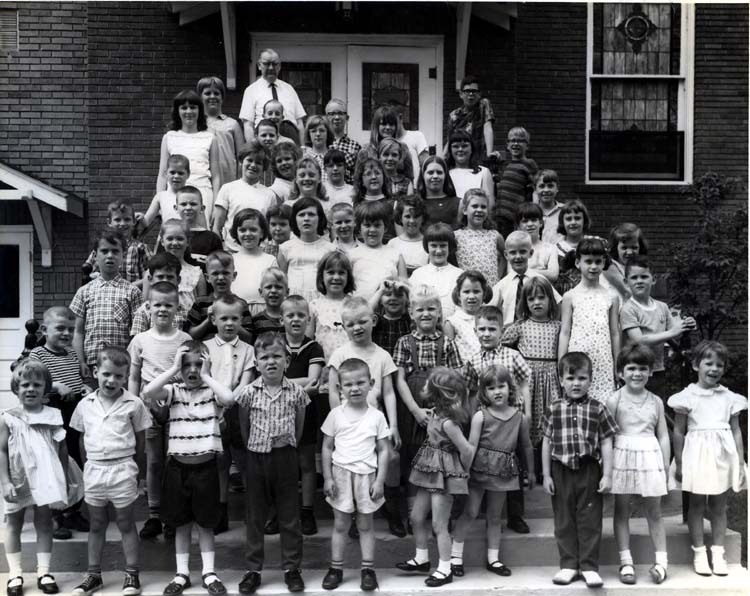 Taken by White Photography, the children of the Emmanuel United Methodist Church on South Main Street in the early 1970s. The same photo session, at least some of the adult members of the Emmanuel United Methodist Church. 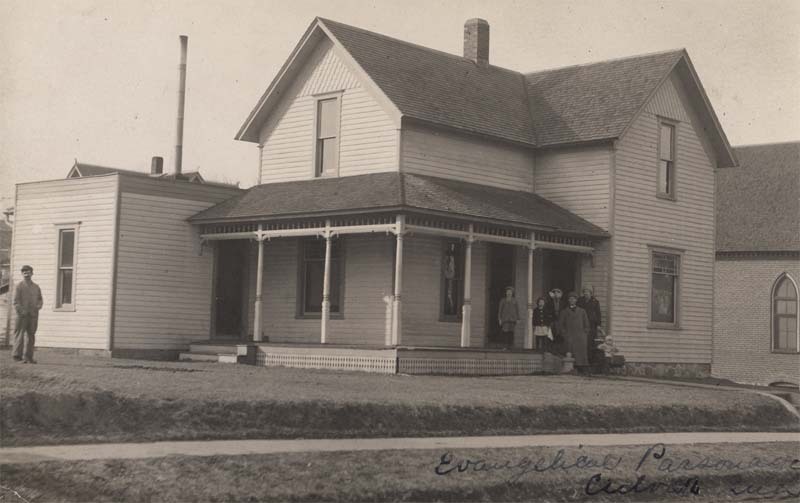 An undated postcard from the Mike Shesky collection depicts the Evangelical parsonage. The Evangelical United Brethren Church on South Main Street, of course, is now the Emmanuel United Methodist church, and the house that was the parsonage, which sat just south of the church building, still stands today, though it no longer serves as parsonage. 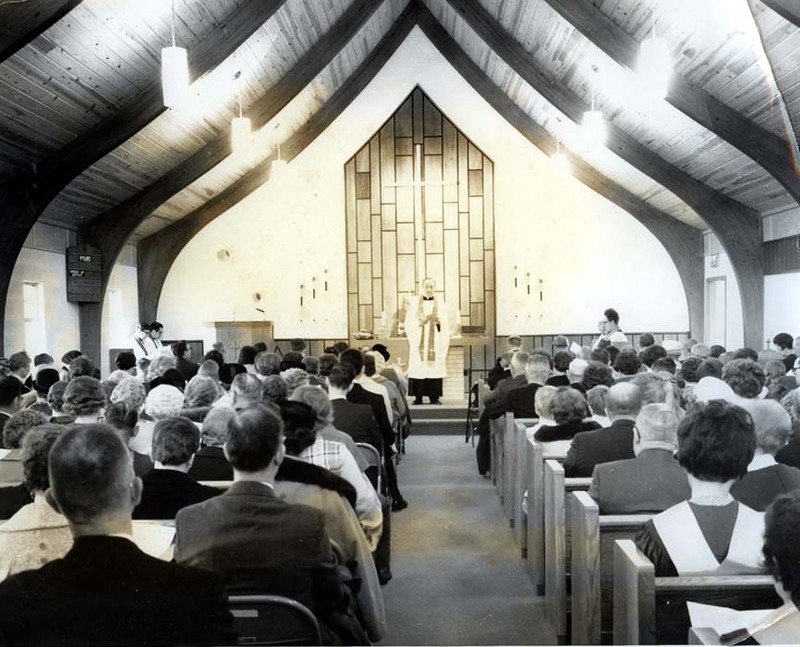 Interior of Trinity Lutheran, circa March 1971, as photographed by White Photography. Trinity Lutheran Church on Academy Rd. as it appeared in March 1971, photographed by White Photography. 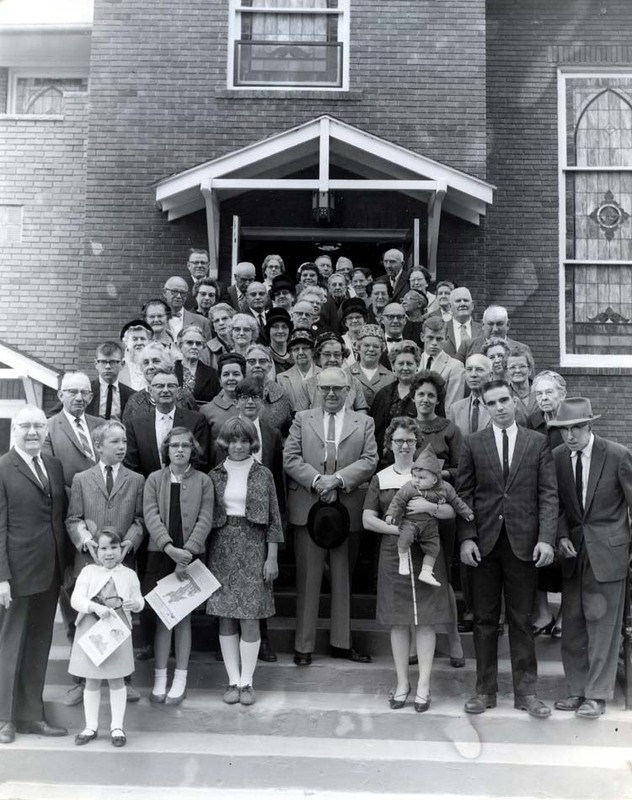 Grace Historical Review, 1985, full-text w/photos: Robert Rust's wonderful 1985 book commemorating the 100th anniversary of Grace Church in Culver is chock full of photos and detailed historical information. View this book. Two early shots of Grace church in Culver (now Grace United Church of Christ). 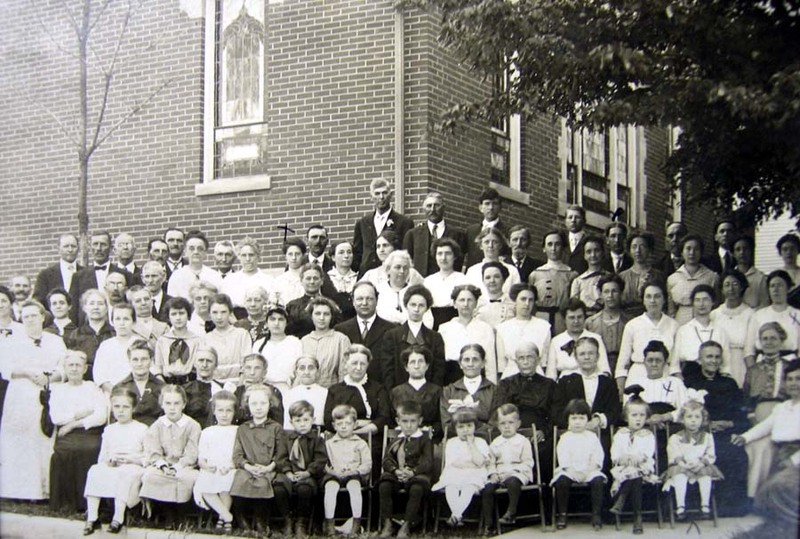 At left, the congregation in 1915. Right, an early shot of the interior of the church decked out for the Christmas holidays. 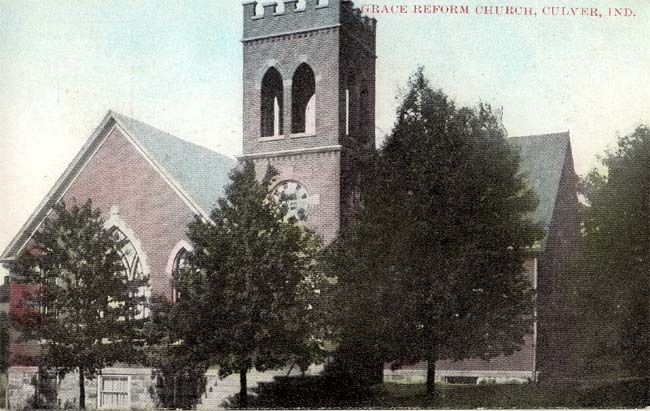 Construction was begun in 1890 on the Grace Reformed Church, shown in this undated postcard. 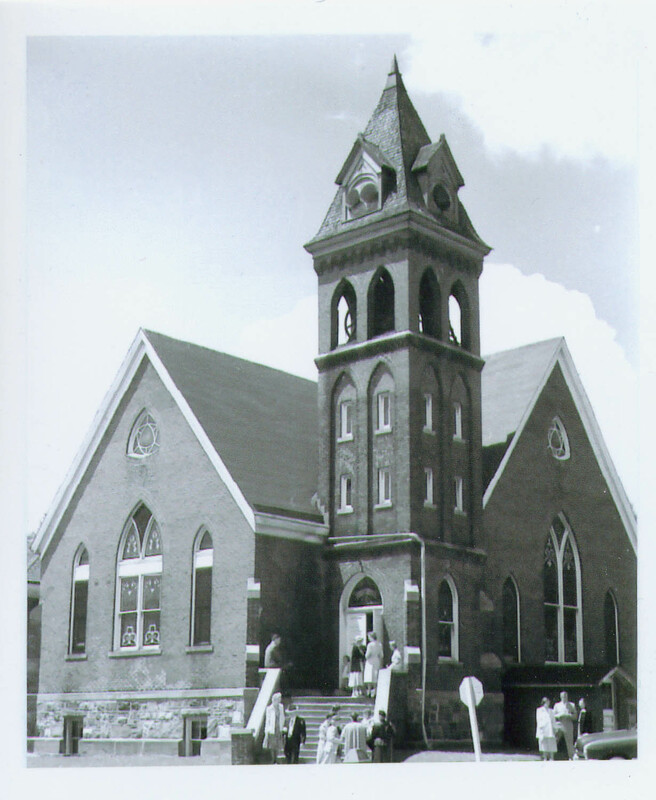 In 1950, the church became the Grace Church, and the building seen here was largely burned down in 1969. The present Grace church on Plymouth St. stands in its place. 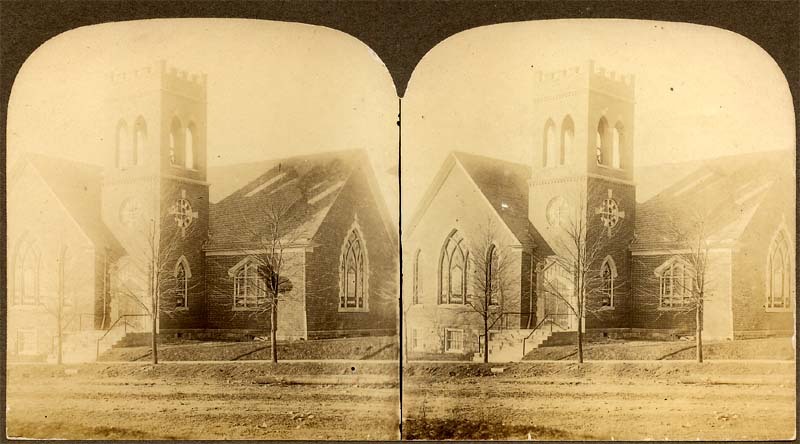 The Grace United Methodist Church, as seen in an undated stereoscope image from Ted Schenberg's collection. March 19, 1908 is the date on the front of this postcard, which depicts the New Grace Reformed Church, built in 1906 and destroyed by fire in 1969. The Grace Church on Plymouth St. now stands in its place. A mystery photo! 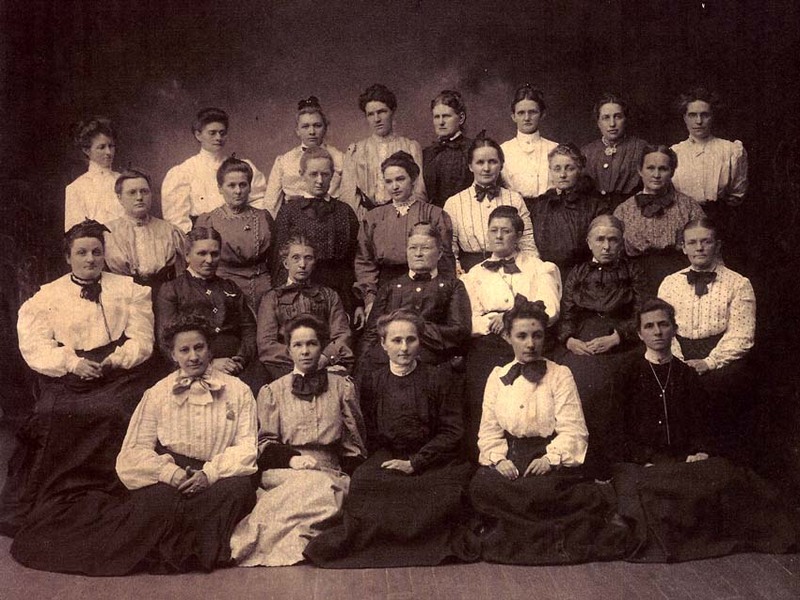 The ladies depicted in this picture are believed to be missionary women visiting Grace Church in Culver, exact date unknown. There is also some speculation that they may have been local people. Anyone with information about the people in this photo is encouraged to contact the library at (574) 842-2941 or email us here. 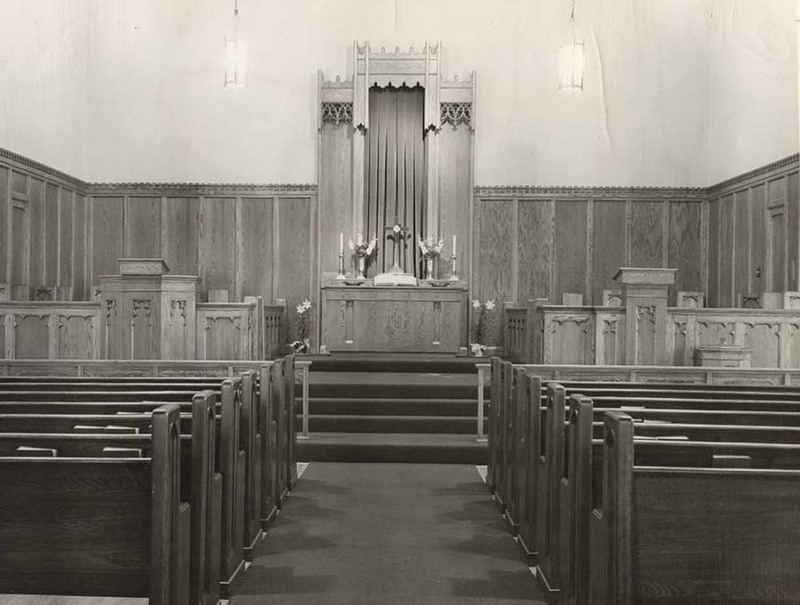 An interior shot of Grace church taken by William Taber in the 1950s and supplied to the library by his wife, Edna Taber. 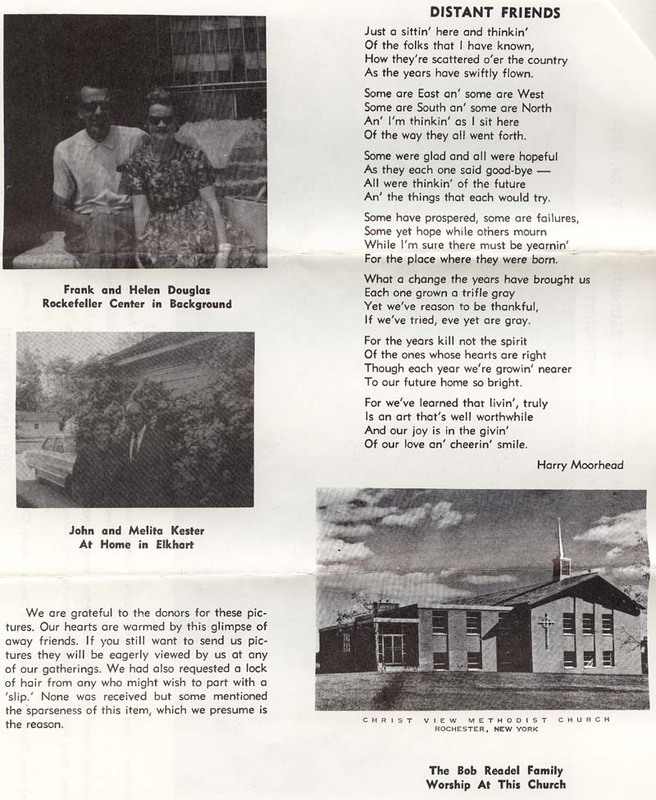 Book: Grace Church Down Through the Years - the complete text and photos of this history book from October, 1960. 1939 article from the Culver Citizen detailing the demolition of the Washington Evangelical Church, which was built in 1892. The article says that the church stood one mile east of the site of the Methodist Protestant church, which presumably refers to the MP church in the village of Maxinkuckee, which in recent decades became the home of the late Bishop C.R. Sheridan and his wife. Joyce Winn shared with us her knowledge of this bygone church, saying it was located at the corner of Queen and 20th Roads, very close to the Washington School in that area (that school building, as of now, still stands, but is in terribly delapidated condition, sadly). Joyce said that there was a West Washington Church and an East Washingtonn Church, but the latter burned before she can remember. She does remember this church (the West Washington one) from very early childhood recollections. She remembered several people who would have attended the Washington church, includeing "Wash" (George Washington) Overmyer and William Kline, a grandfather to Bob Kline, currently of Culver. Several members of the Kline family -- some members still live in the family farm area today -- would have attended church there, including Debolt and Theodore Kline. 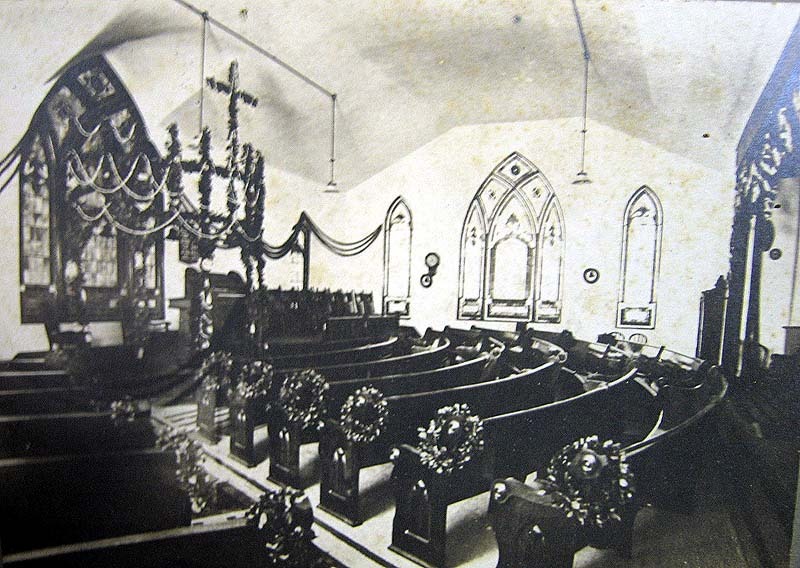 Joyce's own father attended church there, as well as her grandfather, among others. Other sources suggest that the church and the Washington school made up part of a "Washington neighborhood" in that area of Queen Road between today's 18B Road and SR 110. 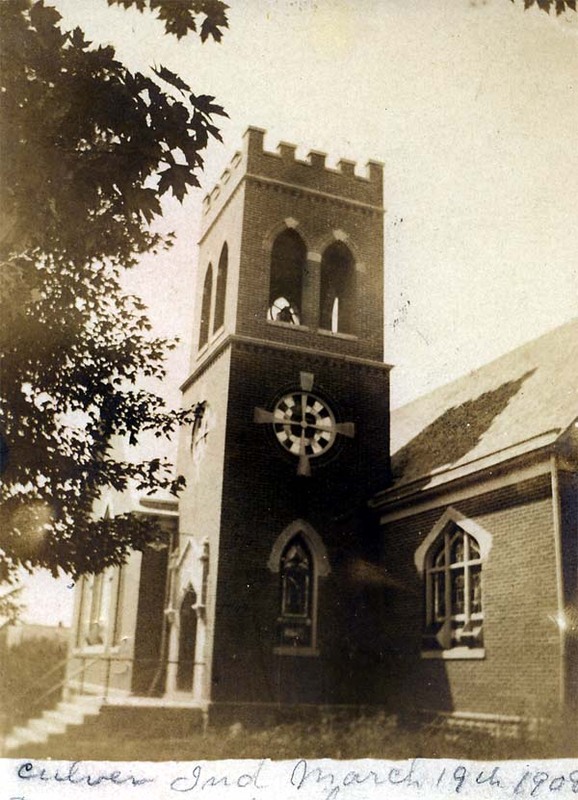 In 1912, Culver's only African Methodist Episcopal Church, Rollins Chapel, opened its new building. No photos are known to exist of the building (if anyone has any, please contact us! ), which sat just off of today's Lake Shore Drive (due south of the McKesson Ford building, today's City Tavern) on Coolidge Court. The church fell into disuse in the 1940s and was eventually torn down as the building deteriorated (today the spot remains an empty lot). 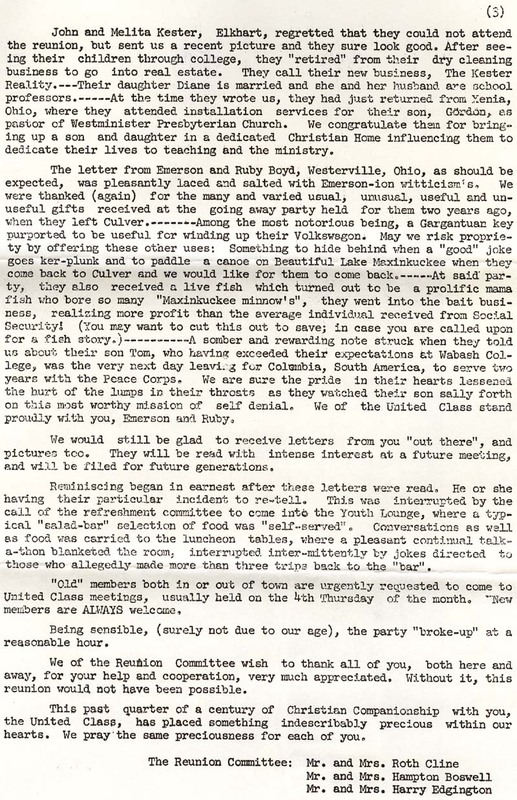 Below is a 1912 article from the Culver Citizen. The new building of the African M. E. Zion congregation was dedi­cated Sunday afternoon with a Children's day service by the members of the Sunday school. 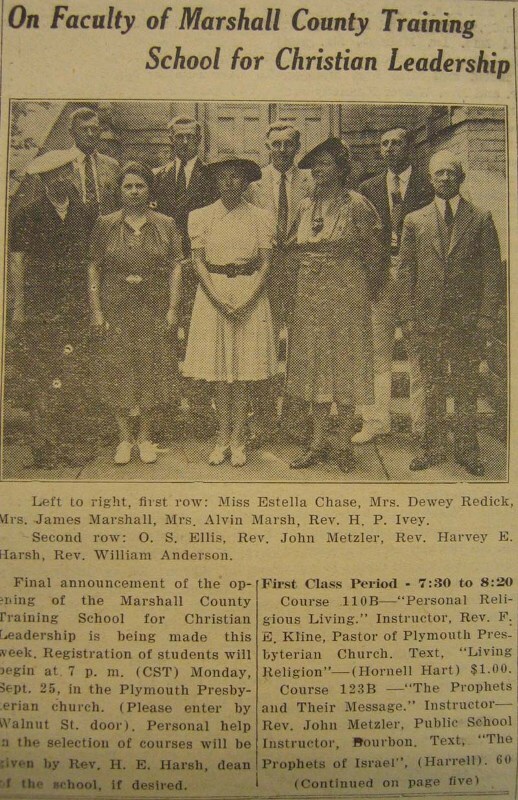 The audience was composed chiefly of white people-men, women and children-who took a sympathetic interest in the program which was arranged and rehearsed under the direction of Mrs. Taylor, wife of the pastor. The children entered heartily into the rendition of their parts and the audience seemed to enjoy every number from the shy recitation of Jeanette Artis, a 3 year old tot, to the graceful elocu­tionary number by Miss Alberta Armstead. At the close of the exercises Pastor Taylor made an ef­fective plea for subscriptions and contributions to liquidate a bal­ance due the carpenter and to pay for the seats and the organ. As a result $22 was added to the avail­able funds of the society. Alex Joplin is superintendent of the school and Miss Alberta Arm­stead is assistant superintendent. The little church is 20x30, and will cost about $450. It is not yet lathed and plastered, but can be used in its present state until fall. As the indebtedness is not large, it is safe to predict that the new society will find its "title clear" to a permanent and comfortable place of assemblage by the time cold weather sets in. The community should rejoice in this effort to develop the religious and social life of the colored residents of Culver. 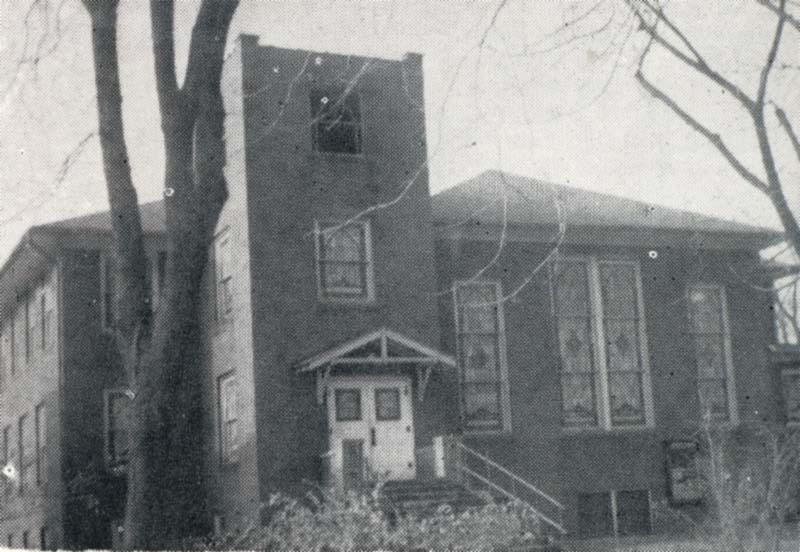 The African Methodist Episcopal Church in Culver was the first a mission, then went into the A.M.E. Conference about 1917. The first pastor under the Conference was the Rev. Charles Bell, who died recently (in February) during a change in Pennsylvania. The congregation worships in a chapel located in Harding Court, between Lake Shore Drive and Washington Street, in the village of Culver. This is a rather small frame building, with an open bell tower. The site is only a few steps a distant from the shore of Lake Maxinkuckee. The chapel is known officially as Rollins Chapel of the African Methodist Episcopal Church, and is a monument to an upright and God-fearing benefactor of his race. The ground for the church edifice was donated by George Rollins, one of the pioneer colored men of Culver, who had property. He came with Colonel Fleet from Mexico, Missouri, when the Colonel joined the elder Mr. Culver in the establishment of Culver Military Academy. At intervals during the history of this church, resident pastors were located at Culver. Among these was the Rev, A.T. Williams, who was assigned as pastor in October 1924. Interest was stimulated when it was then announced that the African M.E. Church would again have a pastor in Culver and the first church services of the year would be held. Above: Two articles from 1925 pertaining to the Rollins Chapel. Left: an August 19, 1925 article on a folk concert recital at the Methodist Episcopal Church (located at the corner of Main and Washington Streets where the library addition is today) performed by the Rollins Chapel choir. It is interesting to note that the church's choir gave performances of what can only have been a unique brand of music to its audience in the Culver of that era. Right: An August 12, 1925 article on the death of George Rollins. There is a respectful tone to the article, which describes 68-year old Rollins as coming from Mexico, Missouri (along with many other early African-American settlers here) in 1899 to the Culver Military Academy as a cook. "All of this community," says the article, "have had nothing but good words for George. He was a man of his word, believed in the right things, and acted out his beliefs." The article further notes that Rollins "saw the need of a church in Culver for the people of his race," and that he donated the land on which the building was built, and worked very hard in the congregation. Mrs. C.L. Watts of Culver was listed as one of his surviving children. Can you touch on the African Methodist Episcopal church in Culver? It was on Coolidge Court, immediately south of what is now the City Tavern building and it (the lot where the chapel stood) is vacant. When that building may have been torn down, I don’t have the foggiest idea. I do know that when I moved back it was already a vacant lot. I know that it (the church) existed. It existed when I was a young kid. We never went there with any regularity, although we had gone. I do know that when my sister was in early high school she would play for them from time to time because she had developed into a fairly decent pianist. Do you remember a Mrs. Fisher in town? Her husband was one of our mailmen in town. I can’t remember if he had our route. He was a rural mail carrier. They had one old guy and I can picture him but I can’t remember what his name was. The name of the church was Rollins Chapel. I know you said you weren’t around when it started, but you have any idea of how long the church had been established? This is a pure guesstimation, but I think somewhere in the middle to late twenties. By the time you became aware of it, was it somewhat well attended? I don’t remember if it had a weekly service. For some reason I think it was on a monthly basis, but again that’s somewhat sketchy. I think if I had been a vital part of it more I would have a better recollection. Could you describe what the building of the church was like? I remember it was a narrow building, I believe there was a steeple on the front, I would dare say it would have probably sat 40-50 people, I remember it was a frame building. I don’t remember any brick on it, and it had a stone foundation. Was it still somewhat in operation when you graduated high school? 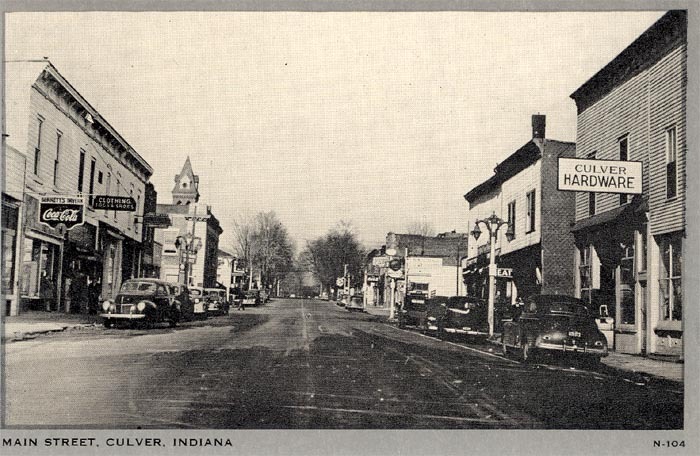 More on the African-American experience in Culver's history here. Bishop William C.R. Shridan died in 2006 a beloved member of the Culver community, having been an Episcopal priest and bishop for much of his long life. He resided last at what had once been the Methodist Protestant church building in the village of Maxinkuckee, after its conversion to a private home. 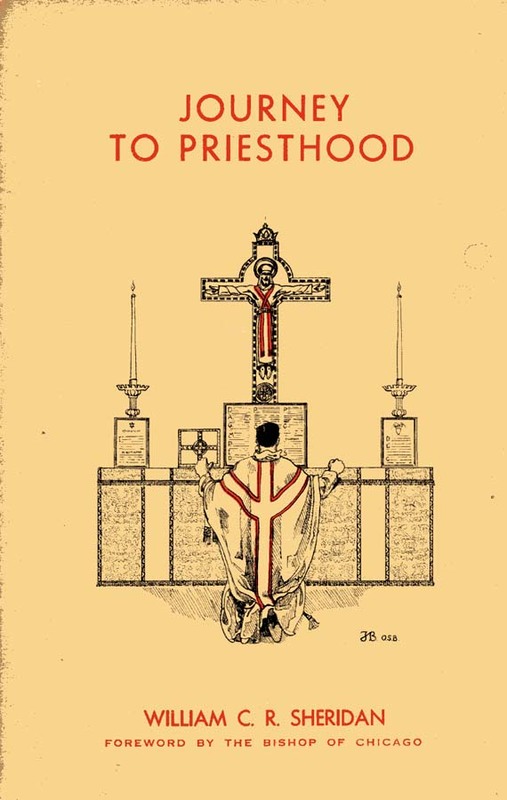 Pictured here is the front cover of one of Bishop Sheridan's early books, Journey to Priest Hood. His latest book, A Gathering of Homilies, is part of the library's collection. 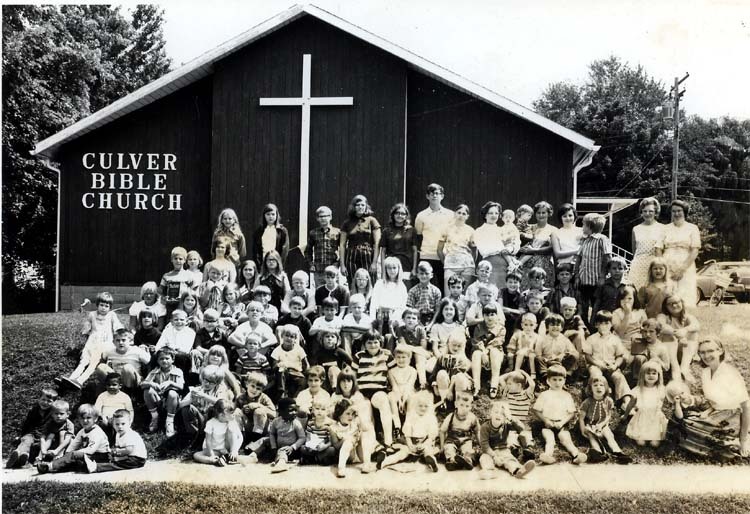 The children of the Culver Bible Church in August of 1971, as photographed by White Photography of Culver. A wonderful artifact (and one of the oldest in this collection) in the form of an 1889 bulletin from the Culver Park Assembly. 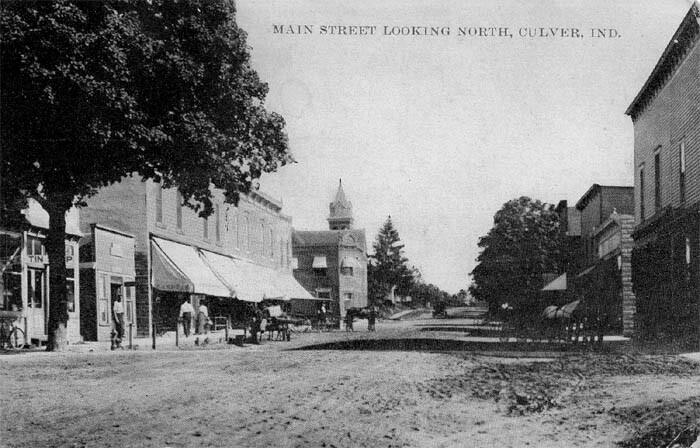 Much of Culver's early history is related to the Assembly, which was started by H.H. Culver, founder of the Culver Academy, as an early, experimental venture (it is often known today as "the Tabernacle" for the place the meetings were often held). Culver abandoned the project after a few years, and little remains of it today. 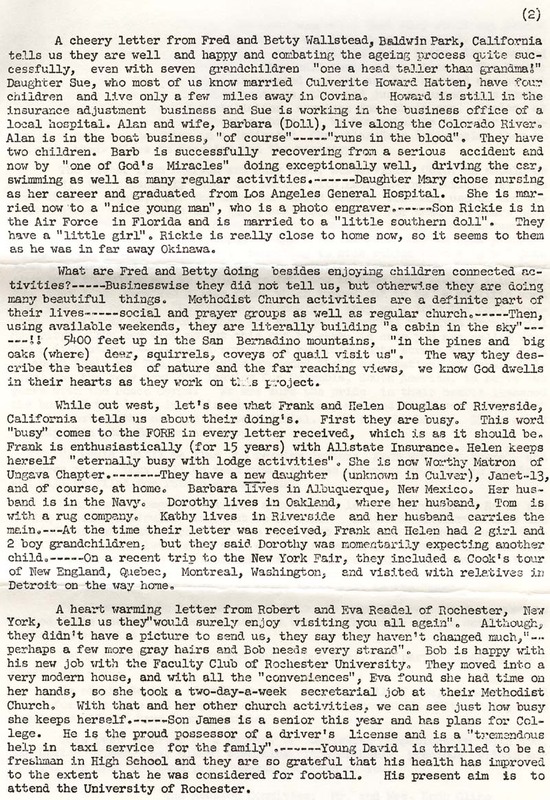 Click the image above to view the entire bulletin, which contains some fascinating glimpses of the area at the time. The Maxinkuckee Chautauqua Assembly, est. 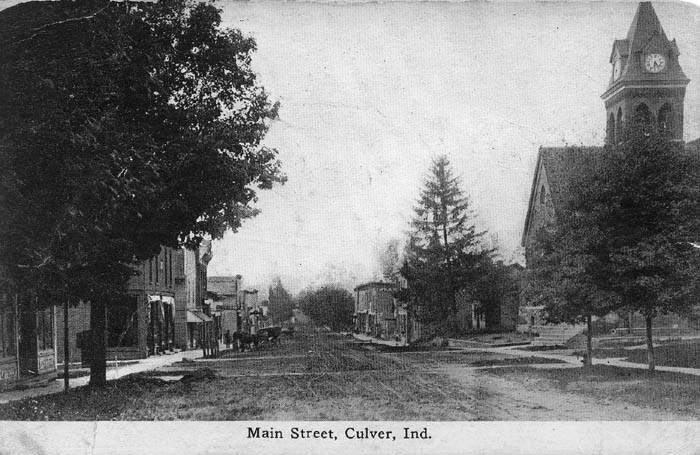 1899, consisted of 26 acres located on the south end of Culver, in what is today the area cut with streets like Nueva Gorda. According to Mark A. Roeder's "History of Culver & Lake Maxinkuckee," the "Maxinkuckee Assembly of the Christian Church," its official name, was quite elaborate and had many refined educational opportunities. The existence of the Assembly also accounts for the origins of some of the unique, Spanish-origin names of the streets on the south end of Culver. Click here for detailed information and more photos of the Assembly and its literature. 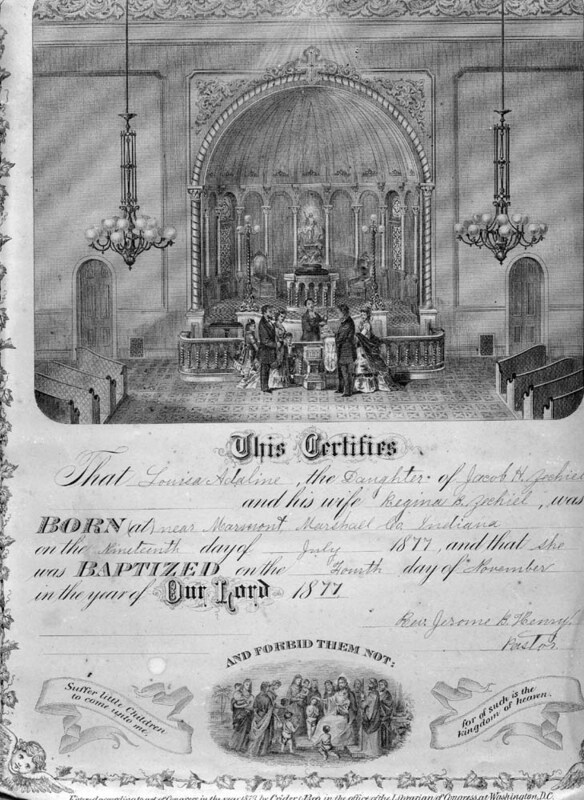 Baptismal certificate for Louisa Adeline Zechial, daughter of Jacob and Regina Zechiel, baptized on Nov. 4, 1877. Louisa was born, says the certificate, near Marmont, Indiana (now Culver, of course) but unfortuantely the name of the church is not mentioned here, though the pastor was the Rev. Jerome Hensy.